It was almost a year-and-a-half ago that I started this little blog. Time certainly does fly. 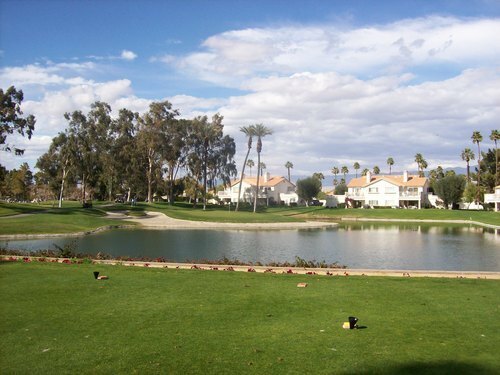 My first story was a review of an overnight trip I took to the Coachella Valley in October of 2011. 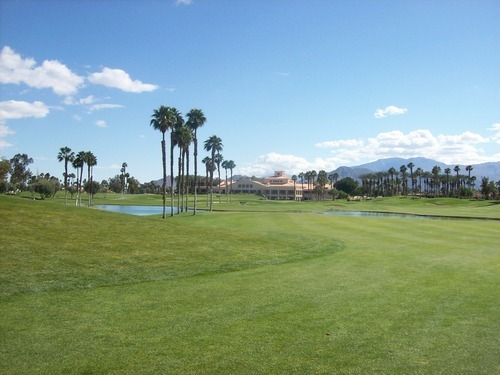 So, the first course I ever reviewed was The Golf Club at Terra Lago (South). My stories have evolved a little since then and I realized more pictures would be better, but it’s still a fun flashback. Why do I bring this old story up? 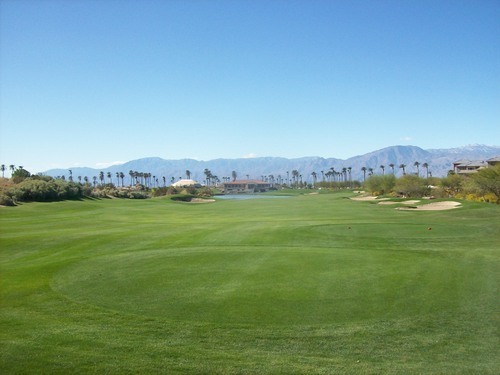 Well, it’s because things came a little full circle for me yesterday as I returned to play at The Golf Club at Terra Lago in Indio. This time, though, I played the North course. People generally seem to rate the North over the South. 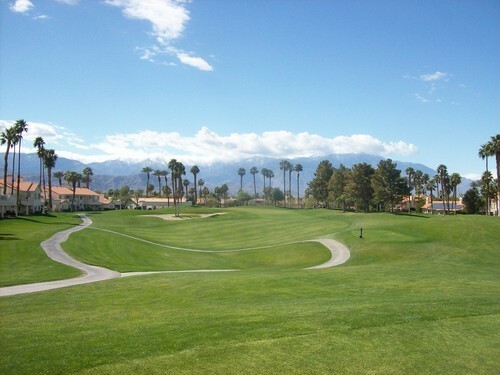 I think they are both very underrated courses, especially since you can generally find decent rates there compared to some of the higher end public/resort courses in the Valley. In my opinion, the main reason people seem to like the North more is because of the three gorgeous water holes: 14, 15 and 18. You get a great view of them from the clubhouse and they are definitely intimidating from that vantage point. From the angles you get from the clubhouse view, it looks like there’s little-to-no room for error with steep slopes running off the sides and back of the greens (and clearly shaved-down turf) into the water below. The 14th hole is a great short risk/reward par-4 that tempts you to bite off more than you can chew. Longer hitters can go for the green, but there isn’t any room for error. 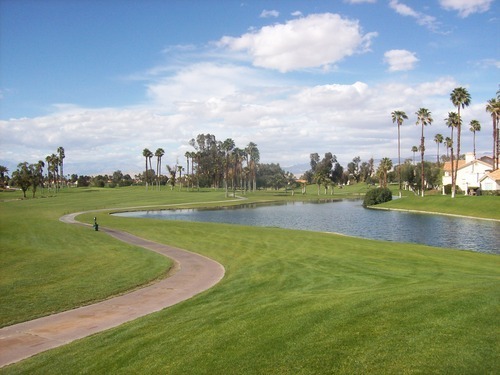 Cautious players can lay up to the wide landing area to the left, but even that’s no picnic and you’re still left with a delicate shot into the green with the water looming behind. The 15th is a short par-3 (depending on which tees you play). 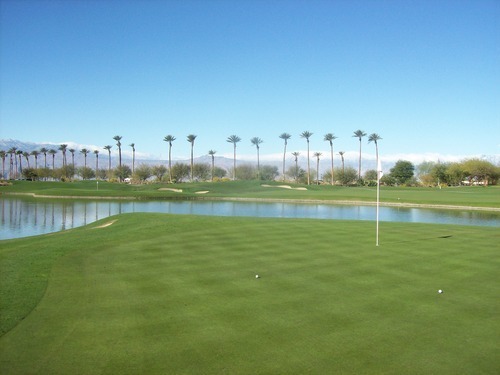 It’s an island green, but the complex is large and the green is deep. This one seems like the toughness depends partly on pin placement. It was up front for us yesterday, which was forgiving. If it’s in the back, it would be much more intimidating. Then, you have the beast—the 18th, a long par-4. The water only comes into play off the tee for really long hitters, but then it’s a major factor the rest of the way in. Short hitters may choose to lay up to the right and play it as a three shot hole (like I had to do after a mediocre drive). The green is protected on the left and behind by the water and those aforementioned shaved-down false edges, so you have to figure out how aggressive you want to be. 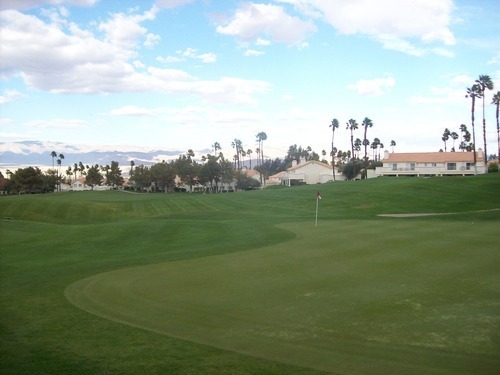 On all three of these holes, though, the greens are much larger than they look from the clubhouse view. So they are admittedly not quite as intimidating from the course level, but you still have to be very smart with your approach shots and angles. Beyond those three holes, the North and South courses have a lot of similarities. 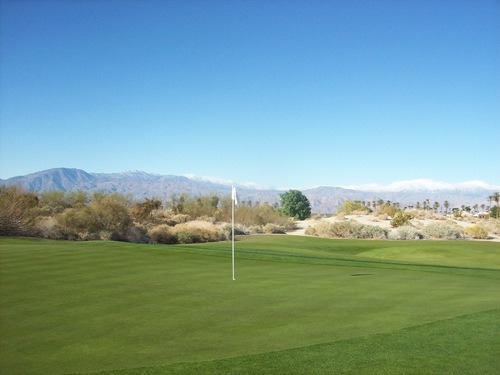 The front nines run parallel to one another and feature similar remote desert scenery in the northeast part of the Valley. 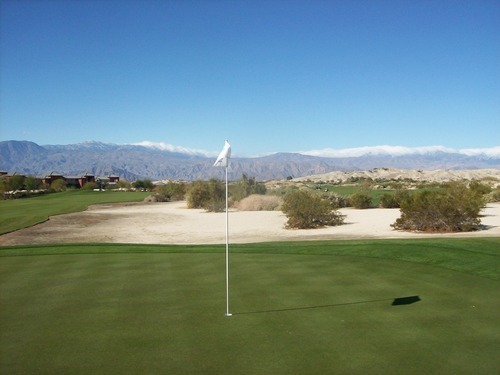 The nice rugged desert design elements were reminiscent at times of the acclaimed Desert Willow courses. One other big difference is the canal that runs through several key holes on the South. It only comes into play once on the North (the 9th hole). I really like both designs a lot. 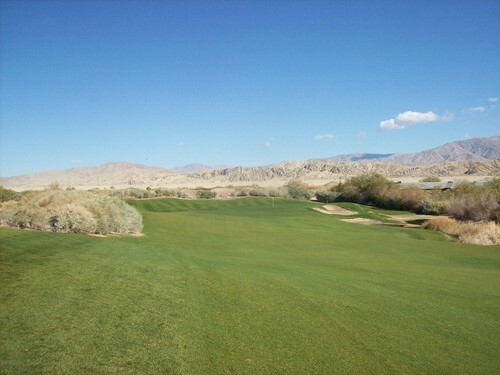 I would agree that those three water holes on North are the most memorable on either course, but overall I personally feel the South is a stronger and more interesting layout. That’s just my opinion, though. 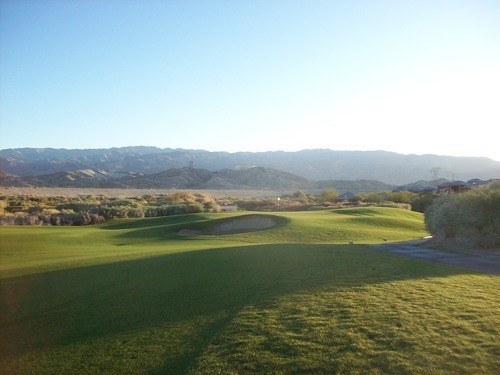 I encourage you to check out both Terra Lago courses and make that judgment yourself. For the price I paid ($65 early bird time), I felt Terra Lago (North) was worth it all things considered. That’s probably the top end of what I’d prefer to pay here. 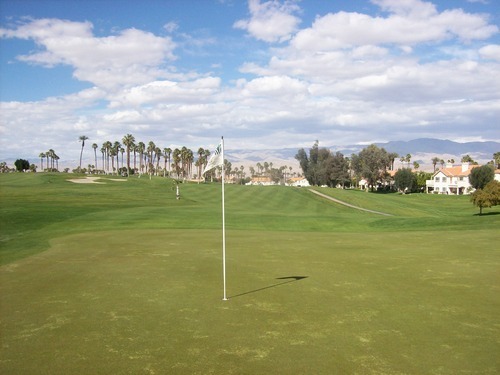 They do have good facilities, good practice areas and excellent service/conditioning that rival most other nice courses in the Coachella Valley. 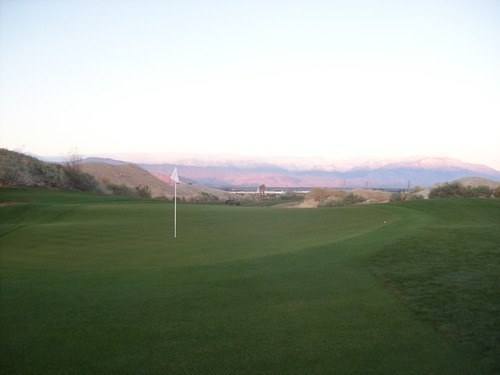 I played early in the morning, first off the tee paired with another twosome from Calgary, and we had a good time on a beautiful morning in the desert as the sun came up and the wind (one thing that could deter people from playing here) stayed calm. 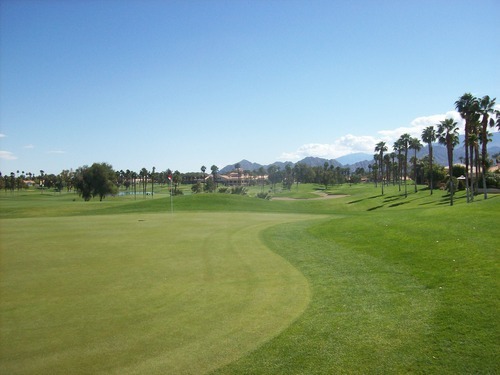 The conditions at Terra Lago were great. 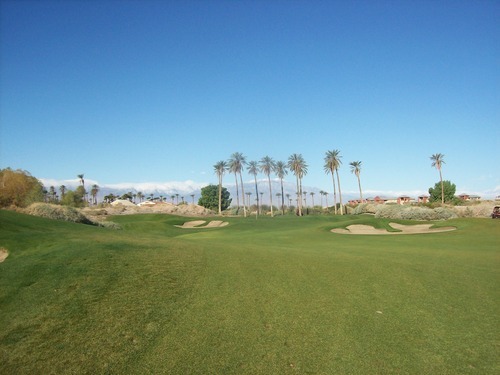 The fairways and rough were excellent for the most part. For whatever reason, the 8th hole fairway was really chewed up with a lot of dead/bare/muddy spots and the 9th hole had a few bad areas, too. Beyond those holes, though, the rest of the fairways were in really good shape. The greens had great surfaces, but were really pock-marked with unrepaired ball marks (come on, people, fix your marks). That was a little unfortunate. 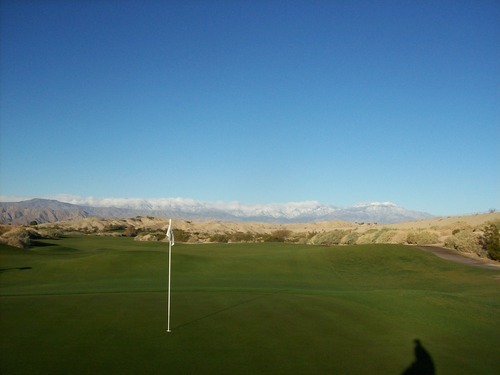 The sand traps had great soft sand—perhaps too soft because my one bunker shot was a fried egg! All in all, it was a great morning on Terra Lago’s North course. This facility features two nice tracks and I can’t imagine you’ll be disappointed at all playing either of them, especially if you get a decent deal in the peak months. My morning round went much quicker than expected, so I didn’t have much to do. I grabbed breakfast and then headed over to Desert Falls around 10:30. I was hoping it would work out in my favor as it often does with these pre-paid tee times. I like to show up early and try and get out ahead of the tee time. When I got to Desert Falls, the place was plenty busy. And when I checked in, they told me there wasn’t any way of getting out before noon. Bummer. I waited around for what felt like ever. I hit a few range balls to try and stay loose. I practiced my chipping and putting. By the time I teed off, my back was ultra stiff and I was yawning uncontrollably, but I managed through the round just fine. 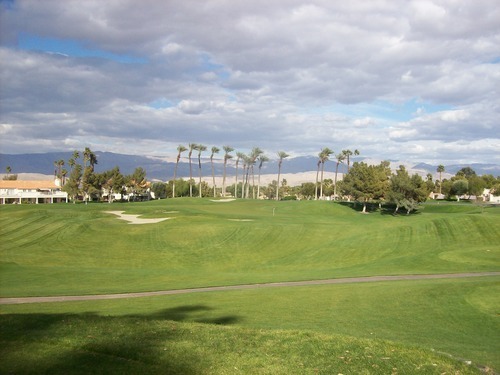 Desert Falls is a place that definitely earns its title as “Country Club.” This place has a very old school atmosphere and felt like a bit of a time warp. The facilities are nice, but quite as fancy as some Valley clubhouses. 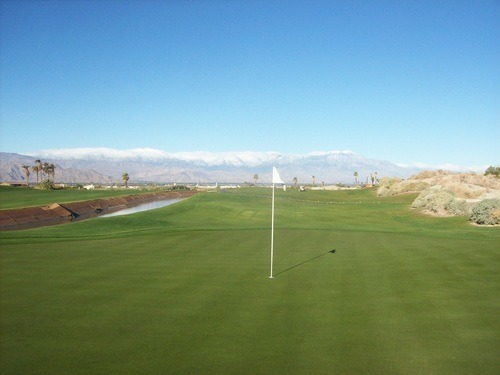 The course is considered semi-private, meaning they aren’t always open for public play. The members were out in force yesterday. Almost all of them had their own private golf carts. Some were very plush and new designed to look like Bentleys, Corvettes and Mercedes Benzes, while others looked like they were built in the 1960s. What made waiting around for my tee time a little awkward is the fact that I was probably the only person there under 65 years old (not counting the staff). All the members/regulars knew each other and I felt like a stranger in a strange land. Everybody seemed super nice and friendly, but I definitely felt way out of place there. The course was pretty organized and they were sending groups off of both the 1st and 10th holes. 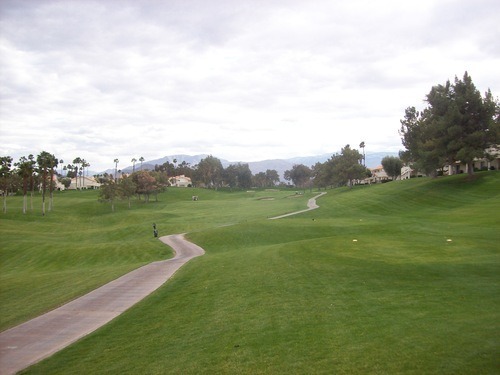 The reason it was so crowded is because they seem to have tee time ranges where they’ll send groups off of both nines in the morning, and then let the course clear before sending out the afternoon groups. Since I bought my time on GolfNow, I figured I’d be paired with other non-members, but I wasn’t. I was paired with three members who all happen to live along the 2nd hole. They were really fun and nice folks, though, so I had a really great time playing with them. 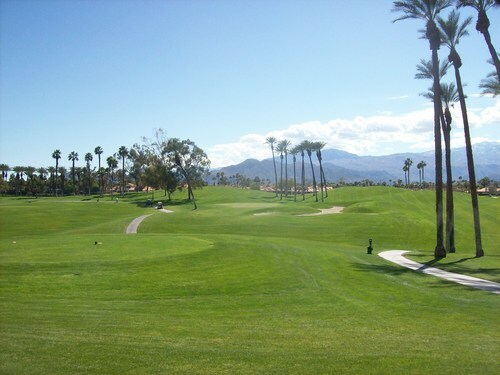 Desert Falls is what I imagine Palm Springs golf being like in the 70s or 80s. 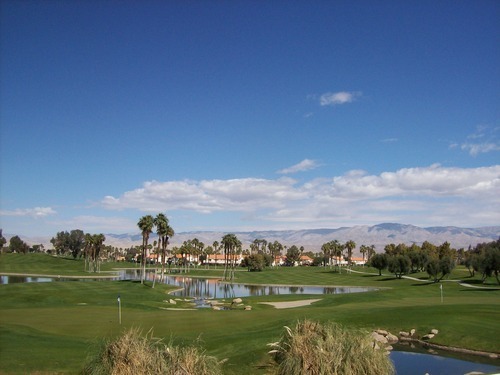 Elderly people (all the “regulars”), classic course design and a no-frills style of service around the clubhouse. 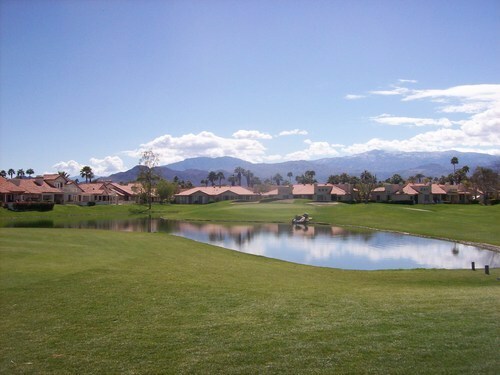 Just people who enjoy the desert sunshine and camaraderie of Country Club life. 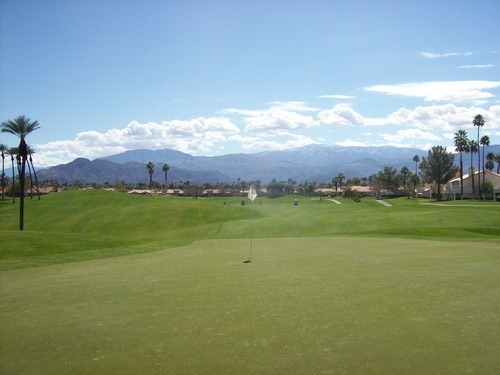 They do a good job of asking players to maintain pace and conditions on the course. The starter made some comments about these issues and gave each of us a little printed flyer that asked players to fix divots, repair ball marks and strive for a four-hour pace of play. There are signs throughout the course reminding you of the ideal pace. And even though it was busy with foursomes as far as the eye could see in front of us, we finished in just over four hours. I have to applaud that kind of commitment from staff and members alike. 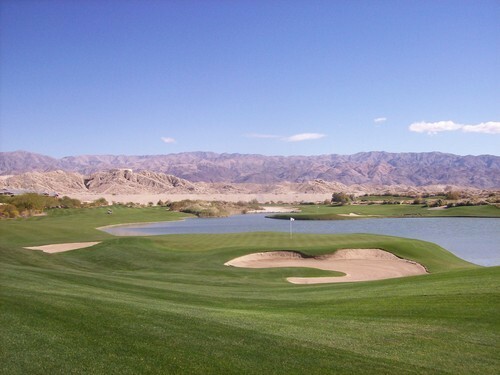 During my morning round at Terra Lago, I mentioned to the guys I was playing with that I was planning to play Desert Falls in the afternoon. 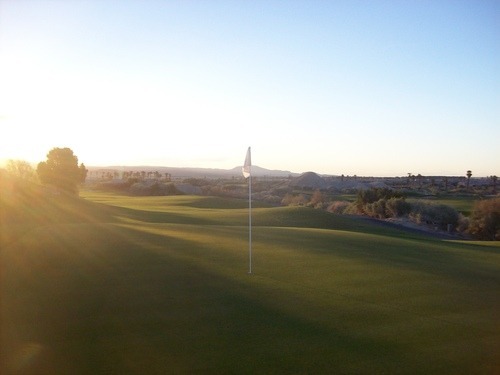 Their eyes opened wide and they were gushing about how beautiful the course was. 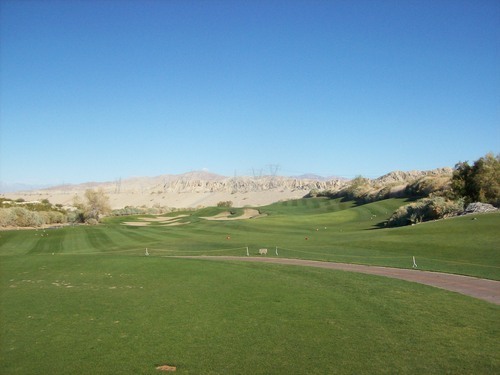 They claimed it was the “most scenic” course they had played in the Valley, so naturally my expectations were high coming in. 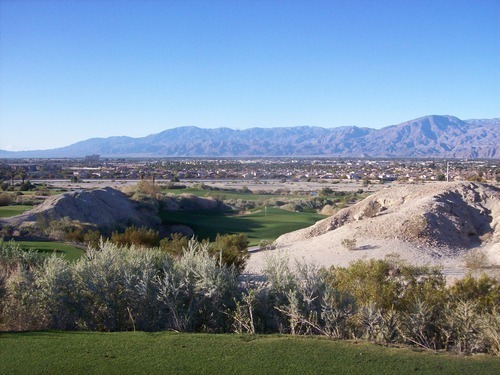 I am not sure if they confused the name with Desert Willow—or Indian Wells or La Quinta or PGA West or SilverRock or Shadow Ridge or Indian Canyons or Classic Club or Eagle Falls or You Get the Idea. 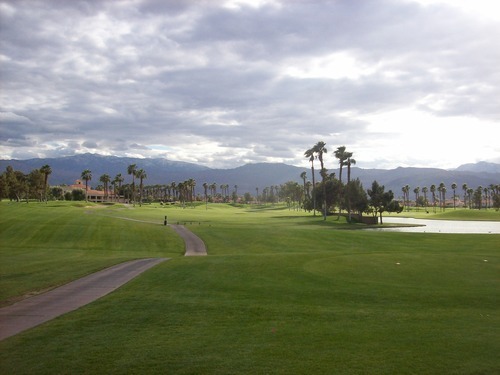 It’s not that Desert Falls is un-scenic, because it’s in a beautiful setting like all Coachella Valley courses and both the 9th and 18th holes coming into the clubhouse with the Santa Rosa mountains behind are very pretty. However, I wouldn’t put it in the same class as any of those mentioned above as far as scenery goes. I found the layout to be enjoyable overall, but I wasn’t blown away by it. 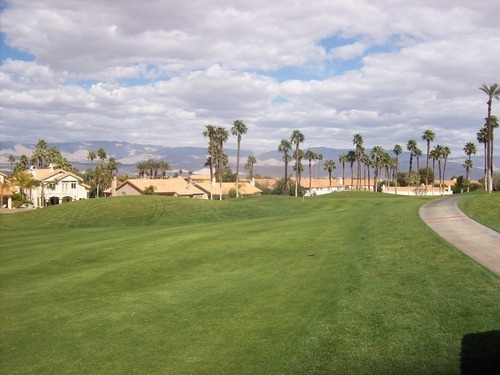 Perhaps more than any other course I’ve played out there, Desert Falls (as its name wouldn’t suggest) definitely has stripped away any elements of the natural desert landscape other than plenty of palm trees peppered throughout the course. There aren’t any sandy waste areas or patches of desert scrub brush. When you miss a fairway here, you are likely in rough unless you are way off course and then you are in someone’s backyard. 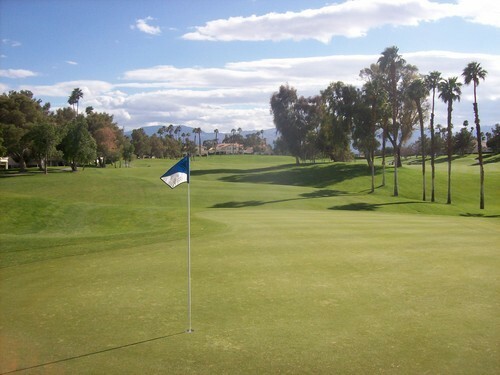 Between many holes there are hills that are covered with beautifully manicured green grass. There are plenty of bail-out areas from tee to green. I’m sure it takes a great deal of maintenance with all this grass. 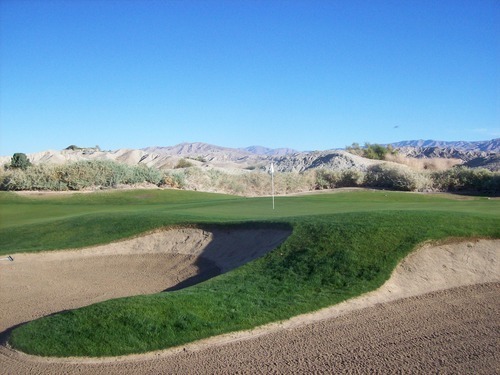 It ultimately creates a more forgiving layout and less chances to lose balls, but I personally prefer more of a natural “desert” look. Desert Falls is a change of pace and more of a throwback design for this area, so I still enjoyed it plenty. One of the guys I played with (who has been a member for 11 years), mentioned that a few years ago they removed a bunch of fairway bunkers on the whole course to make it a little more resort/member friendly. I would like to have seen it before the facelift. As it is now, it is very forgiving off the tee. 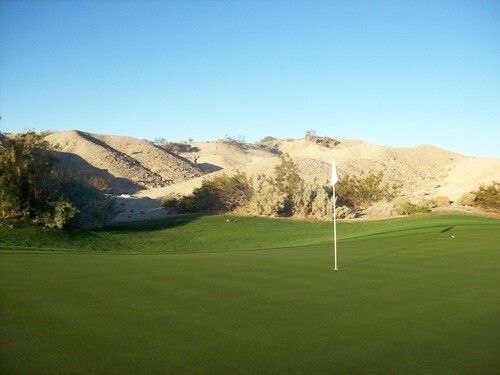 Where Desert Falls does offer plenty of challenge is on the greens. They are big and have every unusual shapes and slopes, making for awkward chips and uncomfortable approach shots. The pins always seemed tucked in one corner or another, making them hard to get at. 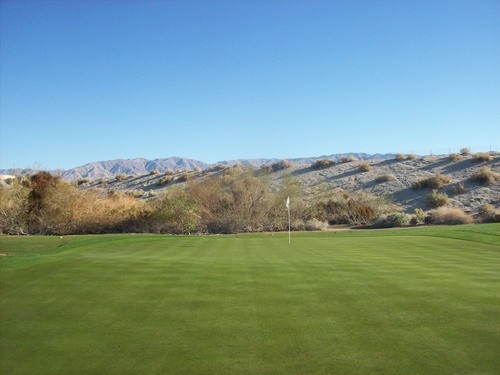 One green—on the par-3 14th—stands out because it is supposedly the largest green in all of Coachella Valley (perhaps even all of Southern California). It is a crazy three-leaf clover shape with three vastly different tiers. Luckily for us, the pin was in the friendliest location in the front. If it’s located on one of the two back tiers, I can imagine this hole becomes much, much harder. Another green that caught my eye was on the short par-4 7th. I can’t say I’ve ever seen a green quite like it. It is narrow, deep and snakes around crazily. Again, we were lucky with a front pin placement, but if you end up on the wrong part of this green, you will be forced to hit a pitch shot. There is no way to hit a single putt from one end to the other. I found the back nine to be more interesting and enjoyable than the front with hillier terrain and more dynamic hole designs. 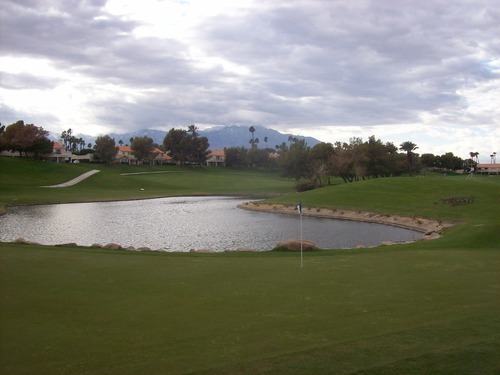 There are a number of distinctive water holes at Desert Falls including the 1st, 9th, 10th, 12th, 16th and 18th. All require good aim and smart strategy from tee to green. 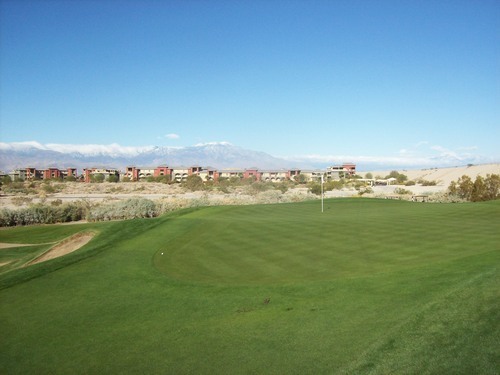 The conditions were very nice at Desert Falls. 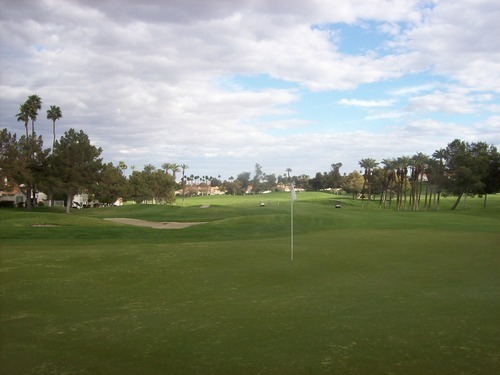 The greens were very firm and a little hard to hold at times, but the surfaces were smooth and running at medium/slow speeds. Some did appear to have a second kind of grass starting to grow in, but it didn’t affect playability. 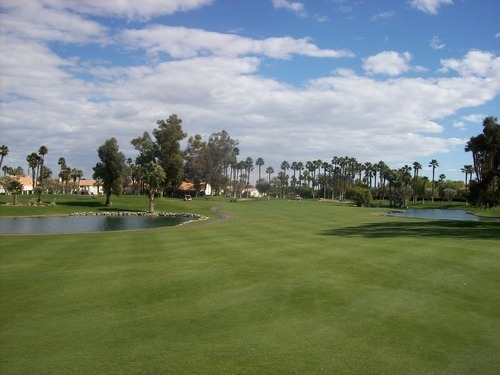 The fairways and rough were excellent throughout the course—lush, green and beautiful. 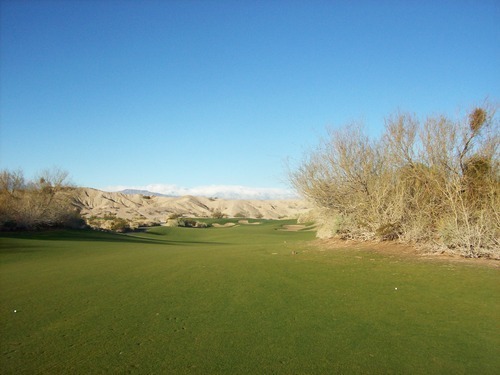 Though the rough wasn’t cut super deep, it was tough to hit from with thick grass that easily grabs your club. I wasn’t in a bunker, but from what I could see they looked good. I didn’t “love” Desert Falls, but I still enjoyed it enough overall to recommend in a heartbeat. 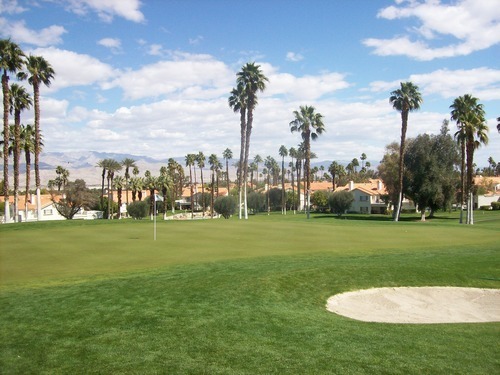 For the right price, it’s a worthwhile course to check out and the old school Country Club vibe is an interesting experience that some might enjoy and others might not. Though I definitely felt out of place at times myself, it was something that ultimately added to my overall experience here.